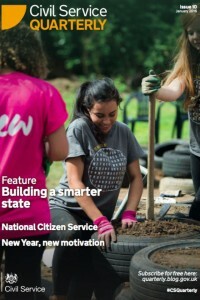 Happy New Year and welcome to issue 10 of Civil Service Quarterly – our first issue of 2016. Following November’s Spending Review, our Building a Smarter State feature looks in detail at developing and delivering the high quality public services we need for less. In The Spending Review in 1000 Words, Julian Kelly – Director General of public spending and finance at HM Treasury – sets the agenda, with an overview of the recent Spending Review and what this means for Government departments in terms of savings, reforms and our priorities in the years ahead. David Allen and Johannes Wolff, also from the Treasury, continue that conversation in Understanding Costs to Unlock Opportunities, explaining how HM Government Finance is helping officials to achieve these essential savings sustainably. Building on this work, Stephen Aldridge, Angus Hawkins and Cody Xuereb, from the Department for Communities and Local Government, discuss the trends in, and drivers of, public sector efficiency and how we can do more to embed them across Whitehall. Charlotte Roberts, Cabinet Office, then explores the evolution of the National Citizen Service. Similarly, in Professional Value-Added Volunteering, Andrea Lee shows the ways in which civil servants can use their professional skills to benefit third sector organisations, and we feature the stories of some of those colleagues – recognised at last year’s Civil Service Awards – whose volunteering is having a huge impact across communities. January is the time of year we commit to live a little healthier and happier. And, in New Year, New Motivation, Professor Kevin Fenton, Public Health England, gives a snapshot of the insights and techniques used to motivate individuals to change their lives for the better. Focusing on our professional development is another important resolution to make and, in The Public Face of the Civil Service, James Bishop – from the Operational Delivery Profession – sets out how the profession’s members are taking control of their careers and boosting our operational capabilities. Our final three articles shine a spotlight on useful lessons and techniques we can use to work more effectively. Colin Dingwall, former Director of the Electoral Registration Transformation Programme, walks us through the crucial steps his team took to implement this fundamental change to the voter registration process. Richard Sandford, from the Government Office for Science, offers a beginners' guide to Horizon Scanning, while Mark Purver and Helen Williams, at the Ministry of Justice, describe the analysis and insight offered by the Justice Data Lab to help design and provide rehabilitation programmes that work. We hope you find this issue interesting. You can share your comments on each post, or use #CSQuarterly on Twitter. And if you have an idea for a feature in a future issue, please get in touch.